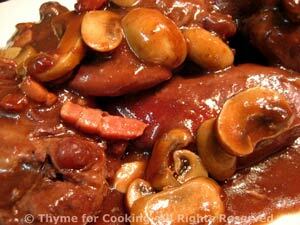 Coq au Vin, easy gourmet dinner recipes. This makes enough Coq au Vin for 2 meals or would be perfect for a dinner party. Marinate the chicken earlier in the day or the night before. Chicken in red wine. Traditionally this would use a rooster (rather than a hen) and cook for several hours (as the coq would tend to be a tough old bird - but full of flavor). Without the skin the flavors get deeper into the meat and we eliminate a lot of the fat. Use a full-bodied Burgundy or Cote de Rhone (or equivalent) for this. Not expensive, but drinkable. Do not use 'cooking wine'. The secret to this dish is the cocoa - it gives an amazing richness and depth of flavor. Roughly chop the onion and carrot. Put the chicken, onion, carrot, garlic and bouquet garni in a deep bowl. Pour the wine over and refrigerate at least 4 hours or overnight. Remove chicken from marinade and drain well (over marinade). Heat oil in heavy, deep pot over medium-high heat. Brown chicken on all sides, a few pieces at time, about 10 minutes. Return all chicken to pan and pour over reserved marinade and vegetables. Add nutmeg and chicken base (if using). Cover, bring to a simmer, reduce heat and simmer for an hour. Clean mushrooms and shallots, leaving shallots and small mushrooms whole; slice large mushrooms in half. In nonstick skillet sauté bacon until crisp. Add shallots to pan with 2 tbs water, cover and cook for 10 minutes. Uncover and cook off liquid. Add mushrooms to skillet and sauté over medium heat until both are nicely browned on all sides about 15 minutes. When done, cover until time to add to chicken. Remove chicken from pan and cover to keep warm. Return sauce to pan removing 1/2 cup. Bring sauce to a boil over medium heat. Put cocoa into a small bowl. Slowly whisk in 1/2 cup reserved sauce. Slowly whisk cocoa mixture into simmering sauce. Continue whisking until it returns to a boil. Reduce heat to a simmer and allow to reduce slightly, about 5 minutes. Dissolve cornstarch in water. Use to thicken sauce to desired consistency if needed. (The cocoa will thicken it slightly.) I used about half - the sauce is supposed to be a bit thick but not gluey. Return chicken to pan along with mushrooms, shallots and bacon. Allow to heat through over low heat, 10 - 15 minutes. Arrange chicken, mushrooms and shallots on a small platter. Spoon some sauce over and serve the rest on the side. 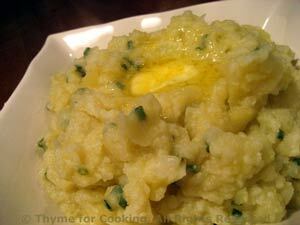 The addition of puréed cauliflower to mashed potatoes adds a lovely flavor and sweetness. Cut cauliflower into large florets. Peel potatoes and cut into quarters. Cook potatoes and cauliflower in barely boiling water until very tender, about 30 minutes. When done, drain and put into a bowl. Add milk, 1 tbs at a time, and stir / mash until you get the consistency you like. Note: Can be put into an oven proof serving dish, covered with foil and kept warm in 200F (100C) oven for 15 minutes.